Start small, prove out the real business need, concentrate on learning how to sell or convert and then retain customers, and you're setting yourself up for bootstrapped business success. In late 2012, I was burned out. I basically had two jobs: I was working full time at Distilled in New York with three to four clients at a time, working 50ish hours a week, and I was also doing freelance consulting for a couple of clients on the side (clients too small for Distilled, otherwise I would've passed them over). I enjoyed the clients I was working with and they were seeing really good results for their investment with me. The problem was that I was exhausted and had zero free time. I was living in Brooklyn at 28 years old and single, but I was spending two full weekends a month in my apartment by myself doing work for clients for money that I didn't need. To me, the ultimate freedom is the freedom to decide what I do with my time. I didn't have that freedom. I decided to stop consulting at the end of that year (December 2012). I told my clients, and they asked me who they should work with. I also had people coming to me through my own website site wanting to work with me. I told them I wasn't taking on new clients, and they asked me who I could refer them to. So, I decided to scratch my own itch and build out that list. As you can see, major minimum viable product (MVP). Now called Credo, the site looks a lot better. We now have a full logged-in application with project feeds, a communication platform, notifications and a lot more. But, it started very humbly, and I believe that all bootstrapped companies have to. You need to nail the market pretty fast. Bootstrapping necessitates identifying a real need in the market. It may not be a moonshot and you may not build a "unicorn" (aka a business valued at over $1 billion), but you're identifying a real need in the market and building your business to suit that. Brennan Dunn started Double Your Freelancing because he wanted to make more as a consultant. Pieter Levels started NomadList because he was a digital nomad and wanted all the data, and to be able to connect with others in the cities where he was traveling to work. Pretty much every agency owner I know grew his or her agency to solve the problem of having to turn away clients because of bandwidth limitations. That's not saying it's easy at all. To get that initial traction, you have to both have knowledge of the area, the skills to build the initial offering (whether product or service), and the initial traction to get revenue coming in the door (or have another revenue stream) to cover your expenses while you build and scale what is initially working. You need to produce revenue. When you don't have a very long financial runway, you need to focus on if people are actually willing to pay you money (in some way) for what you have to offer. 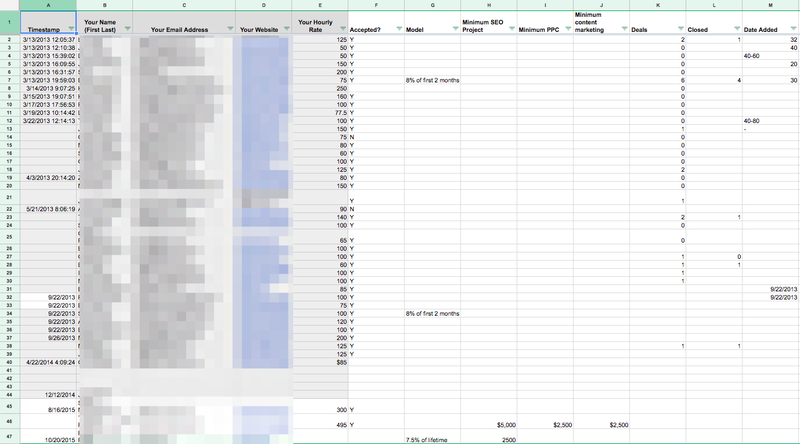 My business started on a spreadsheet. I also didn't own a domain name until the first revenue ($50) was in my bank account. As VCs like Mark Suster say, you need to ring the freakin cash register. "Nobody seems to want to make money anymore," writes Suster. "I remember just a decade ago in 2003 when we all laughed at how dumb people in the 90s were talking about the race to 'capture as many eyeballs as possible' before your competition. You would figure out how to monetize later. "I say ring the freaking cash register. I have said so for years." He goes on to say that some don't necessarily need to do this because they're insanely well-connected and the venture capital will flow for them. But, if you're bootstrapped, there is no VC. There is no "new round of funding" unless you sign more customers who pay you. One of my favorite blog posts in the last year is a cheeky post from ConvertKit founder Nathan Barry about raising money titled "Email Marketing Startup ConvertKit Raises $1.8 million From Large Group of Angel Investors." He gives it away in the second paragraph: "Instead of equity, these investors -- commonly referred to as 'customers' -- are given access to the ConvertKit software product each month." Bootstrapped businesses have both the luxury and necessity to work on what matters. Time is of the essence at the beginning of a bootstrapped business. If you’re not moving your business forward, then your business is dying. You are likely up against established competitors who have bigger budgets than you, thus your focus is required to even stand a chance at competing against them. At the same time, you have the luxury of focusing on what matters because you do not have investors telling you what you should focus on. You get to call all the shots (if you have co-founders, you call them together of course) and move fast and break things. Bootstrapped businesses are amazingly fun because you get to build a business on your own terms. They are also incredibly stressful because you have to generate enough revenue to at least pay your business expenses and hopefully yourself as well. Now that I have a working and growing business, I have future entrepreneurs asking me how they can get started as well. First, write down the pain points that you see in your life and current job. Don't get hung up on if it's solvable. Just write them down. Second, think about how to solve those with content or a tool. Start writing and publishing to see if it resonates. Third, get people to pay you for that solution. Not everyone will want to, but if you can find 10 people whose problem you can solve then you can find 100. Fourth, build that content or tool and start learning if you are actually solving a pain. Keep your overhead costs very low. Fifth, find a few awesome mentors. I am very fortunate to have four entrepreneurs whom I consider mentors that have been instrumental to my business growth. I found them through following their work and providing value to them first, introductions from mutual friends, and in two cases cold email. Bootstrapping a business to a meaningful and lifestyle-sustaining level is an accomplishment in and of itself. Growing it beyond that is even more fun. Start small, prove out the real business need, concentrate on learning how to sell or convert and then retain customers, and you’re setting yourself up for bootstrapped business success.